As we get closer and closer to Super Bowl LIII, the 28 teams who have been eliminated from the playoffs turn their attention to the 2019 NFL Draft. After the week's divisional round, we have four more teams whose orders are set after their opponents defeated them. The closest game that both the AFC and NFC divisional rounds saw was a 20-14 New Orleans Saints victory over the reigning champions, the Philadelphia Eagles. Joining the Eagles are the Los Angeles Chargers, the Indianapolis Colts, the Dallas Cowboys and the Los Angeles Chargers. Many of the players who are projected to go in the first round are capable of turning a team around. So while several teams have suffered disappointing losses that resulted in their elimination in the 2018 season, there is a lot to look forward to in 2019. Here's a look at some of the exciting new prospects to watch leading up to the draft and beyond, including analysis of a few choices. The last four picks have not been officially determined—as the teams are entering the Conference Championship games—so they are ranked in order of record and conference finish. Nick Bosa may not have been able to play the majority of his 2018 season, but the junior out of Ohio State is a top pick in most mock drafts. Bosa had a whopping 34 total tackles and 8.5 sacks in his 2017 season with the Buckeyes. He was named the Big Ten Defensive Lineman of the Year for his 2017 performance. In the three games he played in 2018, the Florida native notched 11 solo tackles, four sacks and one forced fumble. Bosa's year was cut short when he suffered an injury that needed surgery in the third quarter of the team's third game. He later announced he would be withdrawing from school to focus on rehabbing the muscle. "I was hopeful that Nick would be able to return to play again for us," Ohio State coach Urban Meyer said in a statement, according to ESPN. "I know this was an extremely difficult and emotional decision for Nick and his family, and I wish him well as he moves on to get himself 100 percent healthy and ready for his next chapter." If the defensive end were to go as the first pick of the 2019 draft, he would find himself on the Arizona Cardinals—the team with the worst record at 3-13. The Cardinals struggled to keep opponents off the board, allowing teams an average of 26.6 points per game. Coupled with an inability to get anything going on offense, Arizona struggled to win games. Bosa would be a vital part of the defense, which in turn could give the offense more of an opportunity to find a rhythm. Despite being the team with the better record at 12-4, the Los Angeles Chargers found themselves headed home after duking it out with the New England Patriots in Foxborough, Massachusetts. While the Patriots are known for their powerhouse offense, they had struggled this season—even with quarterback Tom Brady at the helm—to score consistently. This did not seem like the case on Sunday afternoon, when they jumped to a quick lead and headed to the locker room at halftime with a 28-point lead over the Chargers. The Patriots were unstoppable on offense, scoring four touchdowns on their first four drives, and then recovered the ball to score a touchdown when they had to punt on their fifth drive. Los Angeles could not seem to figure out how to stop Brady, as well as New England's run game, with Sony Michel running for 129 yards and three touchdowns. So, while the Chargers may not have a chance at a Super Bowl appearance, they can look to the future and focus on drafting a defensive player. Los Angeles has proved that is has a powerful offense, with weapons for the experienced Philip Rivers. However, with a defensive tackle like Jeffery Simmons, the Chargers could compete with some of the top defenses in the league. Simmons, who is described by Ryan Wilson at CBS Sports as a "disruptive backfield presence," had 23 solo tackles and 35 assist tackles this season. The junior out of Mississippi State is massive at 300 pounds and is a force to be reckoned with on the defensive line. 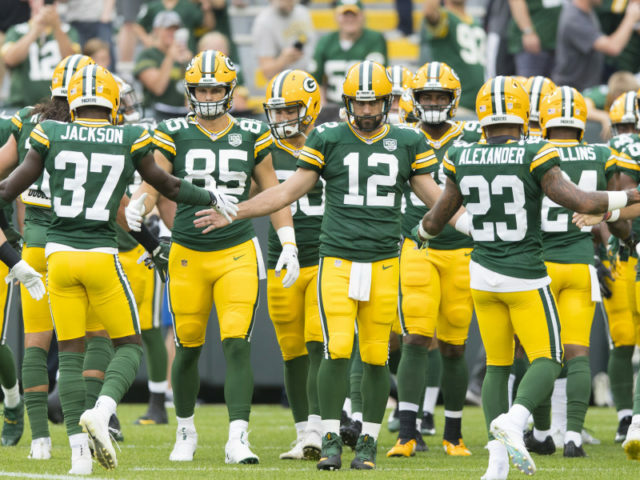 The Green Bay Packers definitely had a disappointing season, despite an all-star quarterback at the helm in Aaron Rodgers. However, with two picks in the first round and a new head coach in Matt LaFleur, Green Bay is in good shape to pick up some weapons. In addition to the 12th pick they received from ending the season at 6-9-1, the Packers have the Saints' pick due to a trade in the 2018 NFL Draft. This pick will be one of the last four of the first round, depending on where they finish. There are many different positions that Green Bay could look to fill, such as the pass rush, wide receiver and the offensive line. But the Packers could pick up defensive end Jachai Polite before anyone else grabs him, or they could take cornerback Deandre Baker. The Packers could use some help in their secondary defense, and the senior out of Georgia could be the player for them. With 31 solo tackles, two interceptions for 81 yards and nine passes defended last season, Baker would be a huge asset to Green Bay's defense. With what could potentially be the last pick of the first round, the Packers should look to secure another weapon for Rodgers to target in the 2019 season. Davante Adams led the team with 1,386 receiving yards and 13 touchdowns in 2018. However, beyond the young wideout, Rodgers didn't have many other receivers to look for in the open field. Taking a receiver like Oklahoma's Marquise Brown could be beneficial for Rodgers' passing game. Brown had 1,318 receiving yards and 10 touchdowns, and despite standing at only 5'10", his explosiveness will come in handy for the Packers.